The eco-city is a term only occasionally heard in Australia. In simple terms it refers to an ecological city, one that aims for circular – closed loop resource systems is climate adapted with clean environmental conditions and sound social support systems. It is aspirational for how we may live in our cities in the future. And while there are no cities that have achieved close to this, at the EcoCity 2013 conference it is clear that many cities globally are collaborating and implementing projects in order to work to wards the ‘ecocity’. From the work undertaken by Ecocity builders over the past 20 years to the C40 cities and EuroCities working groups of which there are forty eight, the ecocity is considered mainstream thinking at this conference. With the United Nations special sessions on monitoring ecocity indicators through to the groundswell activation in events such as ‘Feeding the 5000’, ‘Disco Soupe’ and the ‘Citizens Banquet’ there is a sense that our thinking is shifting as we work towards urban settlements that support the natural ecology and its inhabitants in a balanced ecological, environmental and social approach. 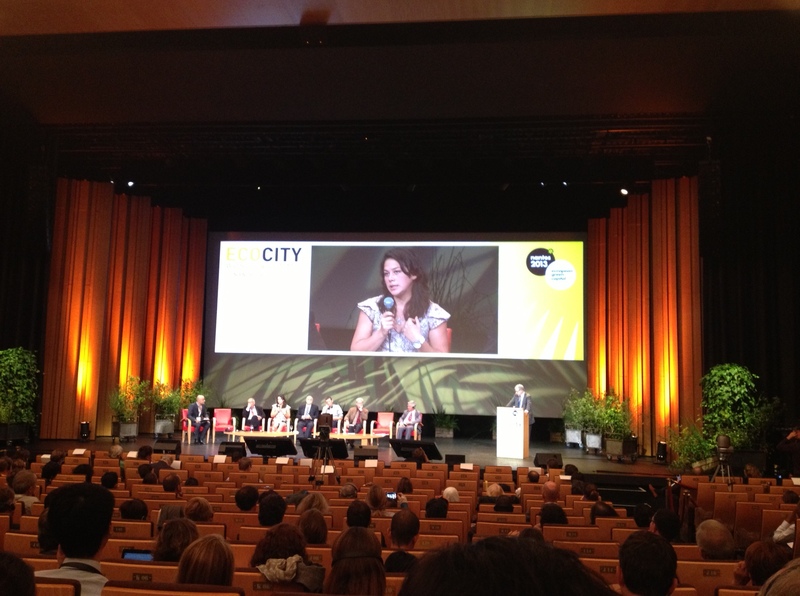 The 10th EcoCity conference was opened by the Mayor of Nantes and Richard Register founder of the EcoCity conference and numerous other local and European dignitaries. In addition Severn Cullis- Suzuki, speaker at the Rio UN meeting in 1992 at the age of nine, was introduced as witness of the conference events, and will give a closing speech to the conference. While there are many governance officials globally here to see the changes and collaborate on how to move forward there are also many industry professionals and community based action leaders, such as Rob Hopkins co-founder of the Transition Network in the UK in his inspirational keynote speech on the opening day. As a guest on the French Green TV studio I discussed ‘regenerating our cities through food resilience’ in the Australian context and a current project mapping the urban and regional food systems in Geelong, Australia. Through developing urban food systems there is an engagement with community and governance in city regeneration. Ecocity 2013 has found a balance of research, governance and action and therefore something for everyone attending. And so as the third day dawns in the beautiful city of Nantes, on the west coast of France, we go back in to hear more stories of city and community led improvements to our cities in the shift towards ecological cities.